The entire workforce at Hillside Music is severally and individually honoured and pleased to be able to offer not only all but also sundry the opportunity to purchase through their auspices, viz. the Hillside online shop at http://www.peteatkin.com/hillshop.htm, Sarah Moule's outstanding new album "A Lazy Kind Of Love". Connoisseurs, such as yourselves, will immediately spot the considerable involvement of several considerable talents who have perhaps become familiar through the "Midnight Voices" CD, to such an enjoyable extent that the additional involvement of yours truly singing harmony vocals on "Living In Overdrive" and Sarah's own superb version of "The Flowers And The Wine" - given a (to me, at any rate) completely convincing change of perspective by means of a few tiny pronoun gender changes - are likely to be of merely incidental interest. Highly, as they say, recommended. Two tracks, the title track and The Flowers and the Wine, from this fine album were played by Russell Davies on last night's show. If you listen again to Russell, they start at 29' 51" and 38' 25", though if you do jump straight to these you'll miss some crackers! This is a reminder that Sarah Moule has some very attractive engagements lined up for the near future. It is especially nice to see that Nikki Leighton-Thomas, the great interpreter of Landesman/Wallace compositions who absence for the music scene has not gone unnoticed, is making one of her now very rare and welcome appearances at Venue M on the 19th. with Fran Landesman, Simon Wallace and Nicki Leighton-Thomas. This concert, in the beautifully restored barn at Leasowes Bank Farm, close to the Long Mynd, is a celebration of the music of Duke Ellington and Billy Strayhorn. A Lazy Kind of Love gets a very good review in the current (July) issue of Jazzwise. Although the reviewer is very much impressed by the quality of the songs Sharah has chosen - the Fran Landesman and Simon Wallace numbers are mentioned, as are the songs that Joe Henry and Jule Styne - he makes no mention of the The Flowers and the Wine by Clive James and Pete Atkin. I myself would say that the ommission is not altogether surprising. Having listened to the whole album nearly a dozen times, I'm finding it difficult to decide which of the album's fourteen tracks is my favourite. At present, and if pushed, I'd probably plump for the title track, which I think is a real knockout. 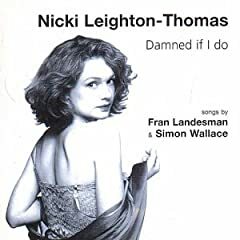 Incidentally, those of you have listened to Sarah & Pete's interpretation of the Landesman and Wallace gem Living in Overdrive may like to compare it to Nicky Lieghton-Thomas and Ian Shaw's treatment of the song. Here., courtesy of Last fm, is their version as it appeared, first on the 2001 Babel album Damned If I Do, an album that was to be repackaged by the Candid label as Forbidden Games. 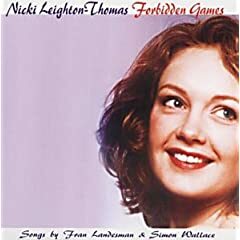 The fact that other tracks from Forbidden Games can be played on Last fm should encourage all who listen to them to go out and buy this fine album while some copies of it are still in circulation. It's becoming something of a collectors item that is really worth having. I second that motion. For those of us what likes a good song, this album, along with Sarah's two previous ones, containing many Landesman-Wallace compositions, are required listening. The Leasowes Bank Arts Festival is definately not held here. If you are thinking of attending, please remember to use the address given on www.leasowesmusicfestival.co.uk as your guide. The date of Sarah's appearance at the festival should read 26th of July 2008, not 26th July2005. ............. Here., courtesy of Last fm, is their version as it appeared, first on the 2001 Babel album Damned If I Do, an album that was to be repackaged by the Candid label as Forbidden Games. With reference to Babel and Candid, I am pleased to note that among the BBC Jazz Awards 2008 nominees in the Services To Jazz category are both Oliver Weindling, founder of the Babel, and Alan Bates, who, having run his own adventurous Black Lion Records from the late sixties to the late eighties, has been of Candid for almost two decades. [Alan Bates founded Black Lion Records in the late 60s, recording artists as diverse as Chris Barber, Thelonious Monk and Sun Ra. In the 1980s he took over the running of the Candid label, signing Stacey Kent, Clare Teal and Jamie Cullum among others. Claire Martin previews this year's BBC Jazz Awards and discusses the key figures in the nominations. Journalist Kevin LeGendre talks to double bassist and mulitilingual vocalist Esperanza Spalding about her recent appearance in London and her debut album Esperanza. Did anyone take sharp-definition pictures of Sarah with Pete during his 606 gig in Chelsea (at which she duetted with him) that Sarah could use for publicity purposes ? Sarah has asked me whether I did so, but being a dinosaur I have an earlier-generation mobile that has no camera, and nor do I have a digital camera. Would be grateful if any MVs who do have pix could let me know by Message - and I'll pass the info to Sarah.